Objective To evaluate cross-sectional patient distribution and standardised 30-day mortality in the intensive care units (ICU) of an inclusive hub and spoke trauma system. Setting ICUs of the Integrated System for Trauma Patient Care (SIAT) of Emilia-Romagna, an Italian region with a population of approximately 4.5 million. Participants 5300 patients with an Injury Severity Score (ISS) >15 were admitted to the regional ICUs and recorded in the Regional Severe Trauma Registry between 2007 and 2012. Patients were classified by the Abbreviated Injury Score as follows: (1) traumatic brain injury (2) multiple injuriesand (3) extracranial lesions. The SIATs were divided into those with at least one neurosurgical level II trauma centre (TC) and those with a neurosurgical unit in the level I TC only. Results A higher proportion of patients (out of all SIAT patients) were admitted to the level I TC at the head of the SIAT with no additional neurosurgical facilities (1083/1472, 73.6%) compared with the level I TCs heading SIATs with neurosurgical level II TCs (1905/3815; 49.9%). A similar percentage of patients were admitted to level I TCs (1905/3815; 49.9%) and neurosurgical level II TCs (1702/3815, 44.6%) in the SIATs with neurosurgical level II TCs. Observed versus expected mortality (OE) was not statistically different among the three types of centre with a neurosurgical unit; however, the best mean OE values were observed in the level I TC in the SIAT with no neurosurgical unit. Conclusion The Hub and Spoke concept was fully applied in the SIAT in which neurosurgical facilities were available in the level I TC only. The performance of this system suggests that competition among level I and level II TCs in the same Trauma System reduces performance in both. The density of neurosurgical centres must be considered by public health system governors before implementing trauma systems. The study is based on a 7-year institutional prospective cross-sectional data collection, including 30-day mortality data, relating to an entire Italian Region. Although the data were gathered in a specific Italian region with a well-established public health system, they are potentially generalisable to other densely populated countries with a predominance of publicly delivered healthcare services. The association between a higher number of neurosurgical centres and greater competition in patient allocation must be considered with caution because several potential sources of differences among intensive care units of the trauma system and trauma centres were not recorded. Considering the highly selected setting and similarities in the basic standard of care among centres, a larger sample is probably needed to detect any minor differences in outcome related to final trauma patient allocation. Currently, most regional trauma systems in the USA are based on the ‘exclusive’ design, but this prevents non-TC acute care facilities from participating in the treatment of less severe trauma patients, with the risk of expertise at non-TCs falling below critical levels. By contrast, Europe - which is more urbanised and has a higher density of hospitals - more frequently adopts an ‘inclusive’ model, encompassing non-TC hospitals (spoke centres) that care chiefly for less severe trauma.8 In this system, level 1 TCs (hubs) are central to trauma system organisation.8 They directly admit the patients who appear most severe at the scene and indirectly receive those who are undertriaged at first admission or who deteriorate after admission to a spoke centre. In 2002, the regional health service of Emilia Romagna, in the north of Italy, designed three trauma systems, headed by three level I TCs, based on geographic location, previous organisational history and presence of clinical expertise (DGR 1267/2002).9 10 The organisations are referred to as ‘Sistema Integrato Assistenza Traumi (SIAT: Integrated System for Trauma Patient Care)’, each representing a separate, specific trauma system. In addition to a level I TC, two of these SIATs also included level II TCss with neurosurgical units. Considering the importance of traumatic brain injury (TBI) in trauma patients, it could be that these neurosurgical units centralise patients who would otherwise have been admitted to level I TCs. The aim of this study was to describe access to intensive care by major trauma patients, within the various SIATs, 10 years after establishment of Emilia Romagna’s Integrated System, and to discuss whether the availability of neurosurgical facilities may have influenced this process. Simplified map of the Emilia Romagna region. The territory is divided into three SIATs and the central location of the three corresponding trauma centres level I (hubs) is reported. The population of each SIAT and each district referring to the level II trauma centre (spoke hospital) are described. The location and characteristics (neurosurgical versus nonsurgical) of the Level II trauma centres (spoke) are reported. SIAT, Integrated System for Trauma. The ‘inclusive’ model of trauma care included community and teaching hospitals not dedicated exclusively to trauma. All were linked to a dedicated Emergency Medical Service, including a helicopter. The SIAT characteristics are described in the appendix (see online supplementary appendix table 2).6 The underlying philosophy of the inclusive hub and spoke trauma system is that level I TCs function as hubs within highly specialised hospitals and other level II TC facilities serve as ‘spokes’. Some level II TCs have neurosurgical units. The SIATs differ from each other in that one of them has no neurosurgical level II unit (Romagna) while neurosurgical units are present in the other two. SIAT with no neurosurgical level II TC. The cross-sectional study was conducted using data from the RRTG. The case material analysed for the study consisted of consecutive cases collected from 2007 to 2012 (see online supplementary appendix figure 1). The criteria for inclusion in the registry was traumatic injury with an Injury Severity Score (ISS) greater than 15 or admission to an ICU.19 20 Consequently, a potential source of bias is that patients admitted to the regular ward were not considered in the study. Injury severity was coded according to the Abbreviated Injury Score 1990 (AIS) (1998 update) by a trained coder at each hospital. Training was self-managed by the regional authorities, with no official certification by the Association for the Advancement of Automotive Medicine. Patients can be transferred from one hospital to another within the trauma system but are recorded in the registry only once. The following attribution criteria were applied for registry entries: (1) the first admitting hospital and (2) the data recorded in the ward providing the most intensive therapy, in said hospital. Patients were also classified in three categories by type of anatomical lesion. The objective was to identify patients with clinically relevant extracranial injuries, those with clinically relevant cranial or spinal injuries and those with both clinically relevant extracranial or cranial/spinal injuries. Patients with extracranial lesions: with at least one extracranial AIS score of ≥3 and a cranial AIS of <3. The data were reported descriptively. Continuous variables were expressed as mean, SD, median and range. Age was described both as a continuous value and in three categories according to cut-off ages of 15 and 70 years. Thirty-day patient mortality was standardised according to several covariates using a hierarchical logistic regression model. This has already been published by our group.28 The model included the following covariates: age (continuous variable), ISS (continuous variable), gender (continuous variable), mechanism of injury (traffic accident, fall, penetrating, other, missing or unknown), motor GCS (continuous variable), systolic blood pressure (0–49 mm Hg, 50–89 mm Hg, 90–179 mm Hg, ≥180 mm Hg). Taking the sum of observed deaths and the sum of the individual probability of death (from 0 to 1, obtained by solving the logistic equation), we determined the observed/expected ratio (OE).29 The OE was calculated separately for patients with moderate or severe TBI or cervical spine injury and patients with severe multiple injuries, and was compared among (1) level I TC in SIATs without a neurosurgical level I TC (Cesena Hospital), (2) level I TCs in SIATs with neurosurgical spokes (Bologna Maggiore and Parma hospitals), and (3) neurosurgical level II TCs (Modena Baggiovara, Ferrara, Reggio Emilia hospitals). All analyses were carried out with the SAS V.8.2 System (SAS Institute). The study was conducted in adherence to regional privacy regulation number 3 of Emilia-Romagna dated 24 April 2006 (Title: Sensitive data processing) and act number 1 of 30 May 2014, which was still in force at the time of writing. In addition, each patient had an anonymous identifier assigned by the Regione Emilia Romagna to enable each individual to be tracked over time without jeopardising patient privacy. After applying the inclusion criteria, 5300 patients were eligible for the study. However, details on the AIS categories were available for only 5287 patients. General and specific characteristics of patients (reported in table 1). Younger patients were more frequently admitted to level I TCs and older patients to level II TCs. Paediatric traumas were chiefly centralised at level I TCs, particularly patients aged <15 (in 91% of cases between 0 and 2 years, 80% between 3 and 8, 76% between 9 and 11 years, and 60% aged 12 years and over). A slightly lower number of patients aged over 80 years were treated in level I TCs (48% in level I and 52% in level II TCs). This observation is more clearly summarised in figure 2. 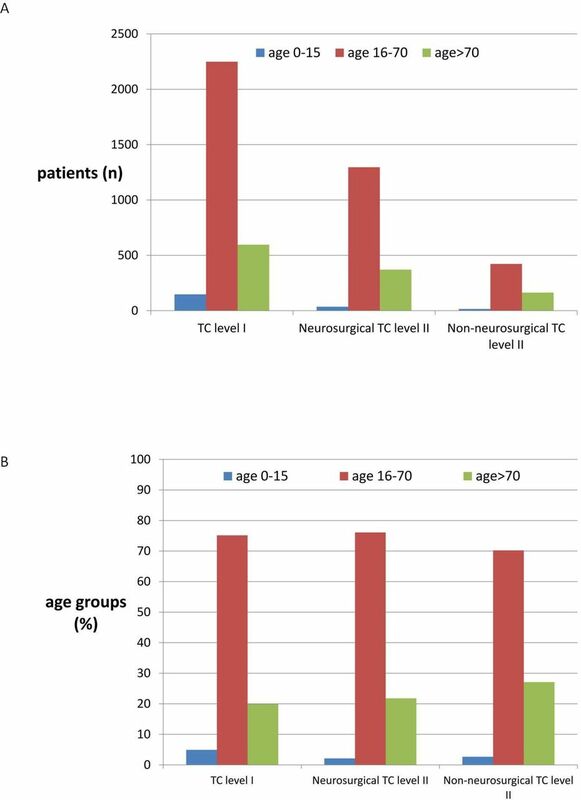 Patient distribution, by age, in the level I TC, the level II TC, with or without neurosurgery. Data are expressed as absolute values (A) as well as in percentage (B). TC, trauma centre. Patients admitted to level I TCs less frequently appeared to have comorbidities. A higher percentage of patients with GCS ≤13 were admitted to level I or neurosurgical level II TCs. Patient distribution according to three patterns of AIS values (reported in table 2). A higher proportion of all trauma system patients were admitted directly to the level I TC of Cesena (hub of the Romagna SIAT with no neurosurgical level II TC) (1083/1472; 73.6%) compared with the level I TCs of Emilia with neurosurgical level II TCs (1905/3815; 49.9%). In the SIAT of Emilia with no neurosurgical level II TC, the proportion of all trauma system patients directly admitted to the level I TCs (Bologna Maggiore and Parma) was relatively similar to the percentage of direct admissions to neurosurgical level II TCs (1702/3815, 44.6%). Indirect admission was more frequent at the level I TC of Cesena (hub of the Romagna SIAT, with no neurosurgical level II TC) (393/1083; 36.3% vs 321/1905; 16.8% at level I TCs of Emilia). Roughly half of the patients with isolated TBI were indirectly admitted to the TC of Cesena (201/392; 51.3% vs 118/861; 23.1% at the level I TCs of Emilia). In the SIAT of Romagna, almost all indirect admissions to the level I TC of Cesena were referred from non-neurosurgical level II TCs (346/393; 88.0%) (table 2). Conversely, the level I TCs in the Emilia SIAT indirectly admitted only a few patients from neurosurgical level II TCs (39/321; 12.1%) (table 3). Observed versus expected mortality (OE) at 30 days was not statistically different among the three types of centre with a neurosurgical unit (figure 3). However, the graphs show the progressive reduction in the mean OE value (meaning fewer observed deaths than expected) moving from neurosurgical level II TCs (Modena Baggiovara, Ferrara, Reggio Emilia hospitals)to the level I TCs in SIATs with additional neurosurgical units (Bologna Maggiore, Parma) and, finally, to the only level I TC in a SIAT with no neurosurgical unit (Cesena). 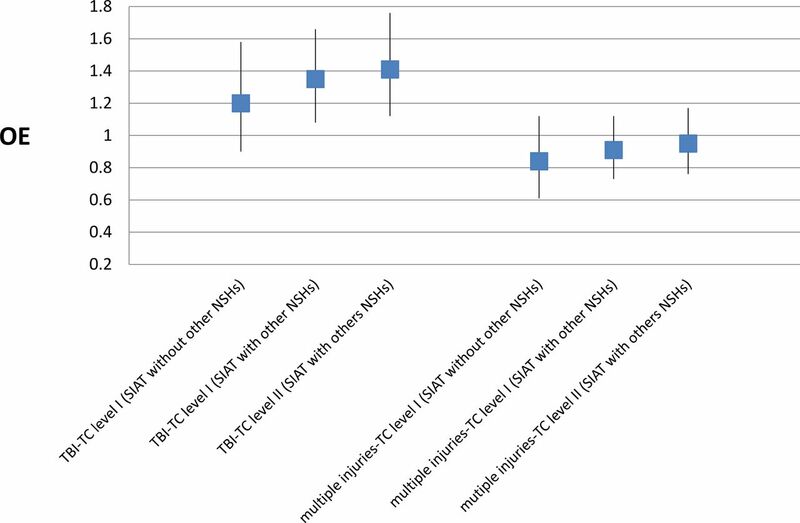 Comparison of 30-day observed to expected mortality (OE ratios with 95% confidence intervals, CI) of patients affected by predominant TBI and patients affected by multiple injuries including TBI, among (1) the level I TC (Cesena) in the SIAT (Romagna) with no other neurosurgical hospitals (NSHs); (2) the level I TC (Bologna Maggiore and Parma) in the SIATs (Emilia) with neurosurgical hospitals other than the level I TC; and (3) the level II TC (Ferrara, Modena Baggiovara, Reggio Emilia) in the SIATs (Emilia) with NSHs other than the level I TC. NSHs, neurosurgical hospitals; OE, observed to expected; SIAT, Integrated System for Trauma; TBI, traumatic brain injury. The study shows that in Emilia Romagna over half of the patients with major trauma requiring ICU care were admitted to a designated level I centre. This is testament to the adoption of good scientific practice. Only 32.2% of the patients were admitted directly to a neurosurgical level II TC. However, the above phenomena is not consistent in the three trauma systems. While patients with isolated TBI should theoretically be admitted to level I TCs, data have shown that they are intercepted by level II TCs with neurosurgical facilities, even though they tend to be less severe. Furthermore, the percentage of patients with extracranial trauma in these centres is higher than in level I TCs but lower than in non-neurosurgical level II TCs, suggesting that level II TCs with neurosurgical facilities act as surrogate level I TCs. Compared with the trauma model originally designed for the Emilia Romagna region, in which level II trauma centres were entrusted with primary stabilisation of directly admitted patients, the system seems instead to have been highly influenced by the presence of other hospitals with neurosurgical units. A study conducted by the same team,32 based partly on RRTG data and partly on the Trauma Mortality Prediction Model that uses International Classification of Diseases Ninth Revision codes (TMPM-ICD9) to estimate trauma severity,28 suggested that younger and more severe patients benefited from admission to level I compared with level II TCs, irrespective of the presence or absence of a neurosurgical unit. Our study does not adequately answer the question whether such allocation affects patient outcome since the wide confidence interval (CI) of OE ratios precludes any statistical significance. Nevertheless, the OE mortality data standardised by patient severity suggest that competition among level I and level II TCs in the same trauma system reduces performance in both. Mean performance values suggest that the level I TC working without competition from a neurosurgical level II TC performs better. Similarly, the neurosurgical level II TC competing with the level I TC in same SIAT seems to have the worst OE. Data seem to indicate that lower competition among centres leads to more volume in level I TC and consequently to more expertise. What does the study add? The study shows that to design a trauma system requires capacity and ability in healthcare provision. The trauma system, based on the principle of centralisation in high-volume centres (hubs), improves prognosis, but also takes account of other aspects, as demographic and orographic characteristics and local health service organisation. Level II TCs are designated to provide primary patient stabilisation and surgery for haemorrhagic patients and to appropriately limit centralisation of patients with numerous comorbidities or who are more elderly or, generally, less expected to derive long-term benefits from more specialised care. They also have a role in night-time centralisation considering, for example, that helicopters are not permitted to fly during the hours of darkness. All these aspects justify the need for spoke centres within the inclusive hub and spoke system. The availability of neurosurgery facilities remains an important variable in final patient allocation, since it can help reduce the volume of patients centralised in level I TCs. Development of a trauma system must considered the specific skills that can affect patient flow over other operating factors such as the centralisation protocols. The study did not evaluate patient-allocation factors associated with rural versus highly urbanised areas, orography, night-time restrictions or individual hospital resources, which can affect supply and demand. No assessment was made of local history, habitual practice prior to implementation of the trauma system or differences in the scope of the auditing process in each trauma system with regard to centralisation. As a result, the study does not explore in depth why the centralisation rate varied in the different trauma systems in the same regional organisation. The association between a higher number of neurosurgical centres and greater patient dispersion cannot therefore be considered a definitive causation. Furthermore, the study results probably also suffer from the lack of inclusion of patients with ISS >15 admitted to a regular ward. The study applies to the region of Emilia Romagna. Within the Italian National Health System, healthcare is autonomously planned at the regional level, thus limiting the generalisability of the results. 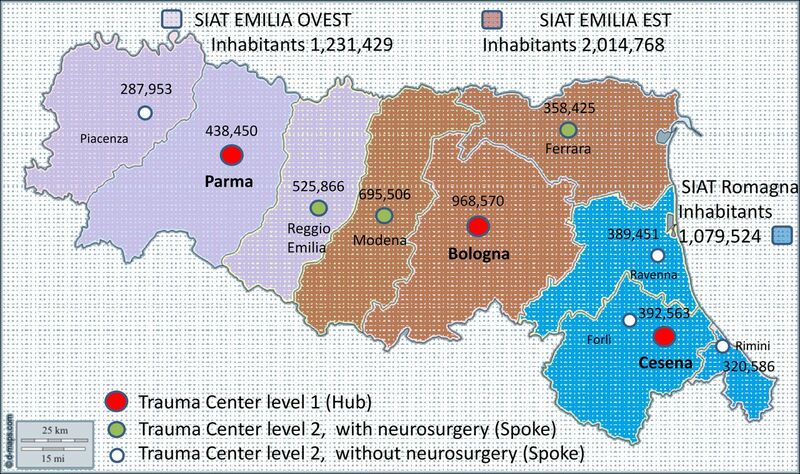 However, since numerous Italian regions have similar orographic and healthcare characteristics to those of Emilia Romagna, and several regions have numerous neurosurgical centres, this report could be of some help to those planning to develop trauma systems. Finally, considering the highly selected territory analysed, and the spread of standards of care, the sample size is probably not yet adequate to observe differences in performance among different subtypes of centre. Lastly, any evaluation of patient distribution should be corroborated by an analysis linking clinical governance to an outcome. In the present study, 30-day mortality was collected and standardised, with findings suggesting that competition among centres does not help improve patient outcomes. The general limitations and strengths related to the use of standardised OE to compare trauma centre performance have been appropriately described by Shafi.29 In the present, highly selected setting, the similar basic standard of care shared by centres probably needs a more extensive sample size to detect small potential differences in outcome associated with the final allocation of different trauma patients. Conversely, waiting to collect several years of data before adjusting system organisation would not be cost-effective. Hence, by associating the data with qualitative system evaluation and expert opinion, the findings—while not statistically significant—could be sufficiently meaningful to anyone appointed to oversee clinical governance of a trauma system. The study highlights that patient centralisation is per se largely driven by the availability of neurosurgical facilities. Consequently, this factor is crucial to the success of the hub and spoke system. These considerations may be helpful in the clinical governance of health services planning to implement trauma systems. We acknowledge the contribution of Joanne Fleming in editing the manuscript. We also acknowledge the contribution of Amedeo Corsi, Alfio Gamberini, Giorgio Gambale, Mario Mergoni and Luigi Targa of the ‘Gruppo di monitoraggio Assistenza al paziente con Trauma Grave (Monitoring Group for the Care of Severe Trauma Patients)’ of the Emilia Romagna Region. We acknowledge the contribution of Joanne Fleming in editing the manuscript. We also acknowledge the contribution of Amedeo Corsi, Alfio Gamberini,Giorgio Gambale, Mario Mergoni and Luigi Targa of the “Gruppo di monitoraggio Assistenza al paziente con Trauma Grave (Monitoring Group for the Care of Severe Trauma Patients)” of the Emilia Romagna Region. Franco Taggi e Pietro Marturano. “Quanto ci costa il trauma? “Salute e Sicurezza Stradale: l’Onda Lunga del Trauma. C.A.F.I. Editore, Roma 2007:565–70.
. Assessment of coma and impaired consciousness. A practical scale. Lancet 1974;2:81–4. , , . Sistema integrato per l’assistenza al trauma maggiore: definizione e valutazione di un modello organizzativo. Consiglio Superiore di Sanità, Ministero della Salute, Roma, 2004. Contributors AC and RDP: idea, planning data set, data analysis, wrote the manuscript. AV, GG: planning data set, discussion of results, wrote the manuscript. CV: planning data set, data analysis, discussion of results. MB, MLRC, AF, AMF, EF, AG, MM, CM, MP, MR, ER, LT, ST: planning data set, discussion of results. Ethics approval The study was not submitted to the local Ethics Committee (Comitato Etico Unico di Area Vasta Romagna, IRSST, Meldola, Italy), in accordance with its own indications. The study was observational and retrospective and was conducted on data collected according to the indications of the Italian regulatory board (Garante per la protezione dei dati personali). The data were fully anonymised and deidentified before analysis.